InTRO is a first stop resource designed to facilitate faculty implementation of educational technology by expediting access to service providers across campus. We encourage innovation and excellence in teaching practice by minimizing obstacles, facilitating connections, and helping identify the appropriate service provider to meet individual faculty needs in a timely fashion. 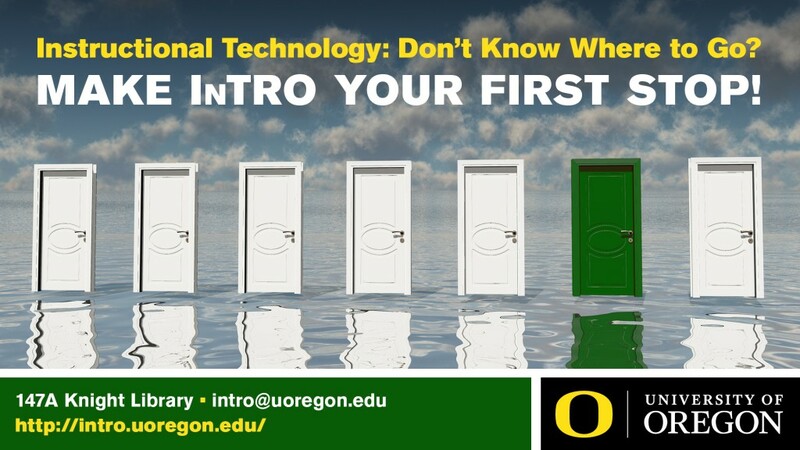 We also gather and disseminate useful, comprehensive information about educational technology resources and services at UO. We are connected to a large collaborative system of service providers responsible for the success of all UO teachers and learners. InTRO assists faculty in navigating access to resources in order to create thriving environments for effective, pioneering digital teaching and learning. Our goal is to support excellence in online and on-campus education at the University of Oregon. A 2012 external review of the University of Oregon’s IT services determined that while UO offers a rich slate of technologies for teaching and learning, the decentralized nature of services made using them a burdensome process. In the fall of 2012, Senior Vice Provost for Academic Affairs Doug Blandy created the Educational Technology Advisory Committee, which was charged with supporting “the development and dissemination of innovative strategies for the effective use of contemporary technology in educational delivery.” Under the leadership of the committee, the UO’s educational technology vision was revised and subcommittees formed to further investigate infrastructure, resources, faculty incentives, and organizational structures. In 2013, this recommendation was refined by Kathleen Leue, Deb Carver, and Randy Sullivan, who drafted a proposal, “Operationalizing a New Educational Technology Vision for the University of Oregon.” The cornerstone of the idea was a referral office staffed by a small cadre of project managers who would connect faculty with the appropriate services, find additional project funding if necessary, track the project through to completion, maintain an up-to-date directory of services, create a database of learning objects that can be repurposed, and establish communities of expertise to aid colleagues in incorporating educational technology into the classroom. In 2014, a collaborative effort between Academic Extension and the UO Libraries transformed this idea into a reality. 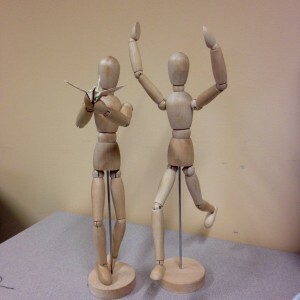 Two program managers were hired through a national search to start up the Instructional Technology Referral Office (InTRO), which opened its doors on August 4, 2015. InTRO is currently housed in the Knight Library and funded and staffed by Academic Extension. Lindsey Freer. Lindsey is a Program Manager in the Instructional Technology Referral Office. She arrived at the University of Oregon in 2014. Gregory Milton, PhD. Greg is a Program Manager in the Instructional Technology Referral Office. He arrived at the University of Oregon in 2014. InTRO was advised and overseen by Kassia Dellabough, PhD, during its first year of operations. In order to establish a presence at the University of Oregon, InTRO created an extensive digital footprint through which they share information, provide the means to request assistance, and enhance their outreach to faculty and staff.